Bel Brands USA, Inc. is issuing a voluntary recall of Merkts Port Wine Cheese Spread sold nationwide with a 9-1-17 production date and a “BEST BEFORE” date of 04-29-18 because a few consumers have reported finding small pieces of plastic in the product. Impacts only the 14-oz. 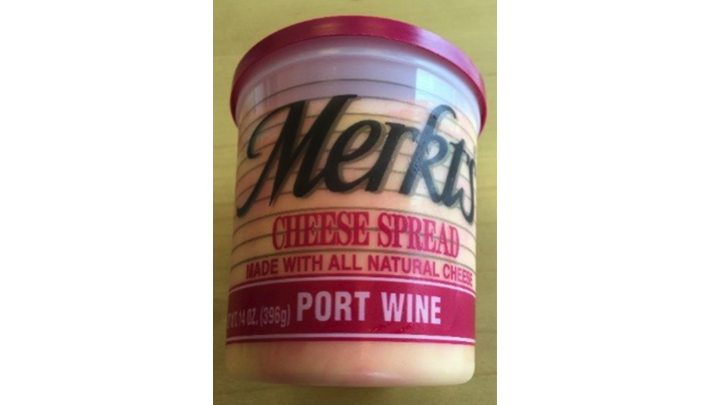 size Port Wine flavor of Merkts Cheese Spread distributed by Bel Brands USA, Inc. and sold by retailers nationwide. All affected products have the “Best Before” date of 04-29-18. The recall is limited to the Port Wine flavor with UPC: 76306 60200 and Batch code: LC2442A. While no injury, illness or allergic reaction has been reported at this time, Bel Brands USA, Inc. is issuing this recall as a precautionary measure. The affected product has a “BEST BEFORE” date of 04-29-18, and was sold by retailers nationwide. The cup carries the above referenced Universal Product Code (UPC) 76306 60200 and product code 1738. This recall does not impact any other Merkts products, including other Merkts flavors, beyond the specific Merkts Port Wine Cheese Spread sold in cups with Best Before Date of April 29, 2018. No other Bel Brands USA, Inc. products are affected. Consumers who purchased the Merkts Port Wine Cheese Spread product matching the specifications listed above must not consume it, it should be discarded, if they have any questions contact 1-888-840-0096 between 9:00 AM to 6:00 PM, Eastern Time, Monday through Friday. The U.S. Food and Drug Administration has been notified of this voluntary recall.